The hamster is a popular pocket pet, but people sometimes worry about getting bitten or accidentally hurting their pets because they don't know how to handle them properly. While hamsters enjoy being petted, you need to understand how to socialize your hamster and handle him so that neither of you gets injured and both you and the hamster enjoy the experience. There are two varieties that are best-suited for handling. The first is the Syrian (aka teddy bear) hamster. The Syrian hamster grows to a size of 5.5 inches, and the larger size of the animal and its ability to bond with an owner makes it ideal for handling. Another species that's easy to handle is the Chinese hamster. Chinese hamsters grow up to 4 to 5 inches and can be moody -- some have a sweet disposition and others are aggressive. Two other breeds to consider are Campbell's and winter white hamsters. 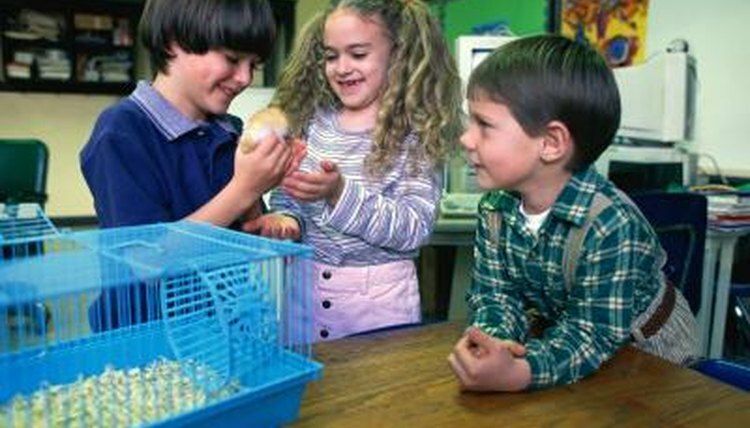 These hamsters are a bit smaller, at 3 to 4 inches, but do well when handled by adults or older children. Small children can easily harm the small hamsters. Socialization is essential with any breed of hamster. Because hamsters have poor eyesight, they need to learn your scent. Socialization begins with placing your thoroughly washed hand inside the cage. You do not want to try and grab the hamster during this phase. Continue doing this each night until your hamster comes over and sniffs your hand. Again, do not try to grab the hamster. Eventually, after two to three more days, your hamster will climb into your hand. Allow the hamster to become comfortable in your hand and repeat the process for another two or three days. Once your hamster is comfortable with being handled, you can gently pick him up. Remember that hamsters are small, delicate creatures that can easily be injured. Pet the hamster gently with your index and middle finger down the hamster's back. Use gentle strokes and never make sudden movements. Chances are your hamster will become relaxed and may even fall asleep while you pet him. Preventing injuries is important for both you and your hamster. Hamster's have very fragile bones, so if you handle him roughly, you could cause an injury. This means you always should sit when handling a hamster. If the hamster decides to jump, you want him to fall a safe distance. If you're standing, the hamster could fall to the floor and break his leg. Sudden movements can also lead to injury. The sudden movement can frighten the animal and cause him to bite.